Most children love helping their parent create a theme based bedroom for them. It is one of the special parts of growing up for any child. In fact, having a room decorated around the things that grab their interest can invigorate a child's mind and make them feel special. Theme based rooms can make a child feel that their room is their own special safe haven, where their imaginations and dreams are safe and sound. There are so many themes available for a child's bedroom today, and picking a theme and decorating a room around it can be great fun. Throughout the ages, children of both genders and all ages have grown to deeply love and be fascinated by ancient dinosaurs. In fact, the fascination over dinosaurs has been going on for generations across the globe. From the days of Godzilla and the childhood story of "Where the Wild Things Are", to the shrouded mystery of each new scientific discovery of a new dinosaur species, dinosaurs have captured the imagination of children of all ages. Today, the unveiling of new species of dinosaurs at museums has sparked a global hunger from children to understand, empathize, and be a part of the fascinating world of these ancient giants. Many children have a great love for these creatures to such a degree, that their fascination happily spills into their bedrooms. For these children, they dream of encountering these giants in their sleep. They watch Jurassic Park and tug at their parents to go to the museum just one more time this year to see these creatures that once lived. These are often the children that play with dinosaur figurines and read dinosaur stories. These children want their bedroom to be a fascinating place where these creatures can live in their imagination in playtime and nighttime. 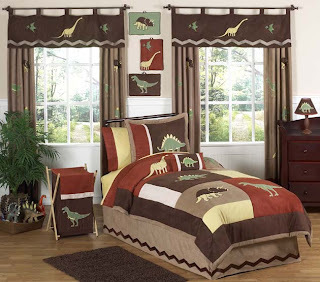 For these children, creating a dinosaur themed bedroom is the perfect answer to fulfill their desires. From dinosaur curtains and wallpaper, to dinosaur comforters and sheets, these children want their room to reflect their passions for these creatures on a broad scale. 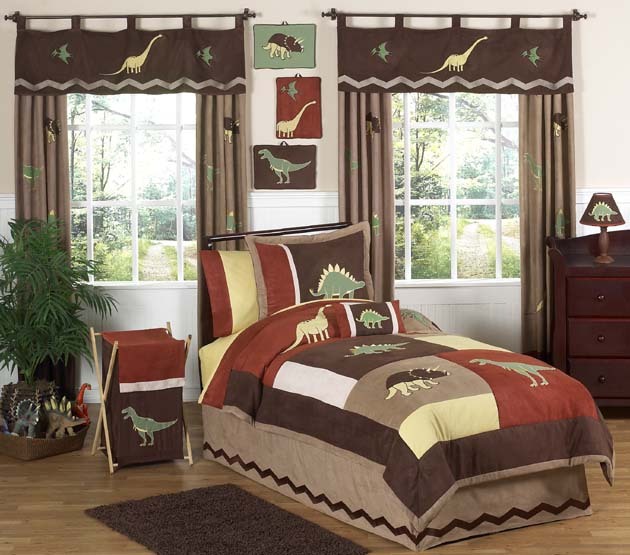 In fact, a dinosaur comforter alone can offer some cozy fulfillment for their dinosaur dreams. Whether creating a magical dinosaur space one piece at a time, or the Dinosaur Bedroom theme is being created all at once, purchasing dinosaur comforters is the perfect way to envelop a child in their fantasies and dreams of these ancient creatures. Made in all sizes, these comforters are meant to inspire the mind of a child or Dinosaur enthusiasts of all ages. In sizes for Single, Double, Queen or King size beds, these dramatically decorated comforters offer a wonderful glimpse into the past of the days of the Tyrannosaurus Rex, Triceratops, Brontosaurus and Pterodactyl.